Boutique Hotel & Hostel Medusa i Batumi, Georgia: Bestill nå! A Property was established 10th of July 2017, it was my house and because it has great location i decided to open Boutique Hotel & Hostel. It is fresh, with modern design and especially selected colors for maximum comfort. Our staff is selected from 100 people casting, they speak English, Russian, Georgian and German, they are young, positive and will help in any direction. 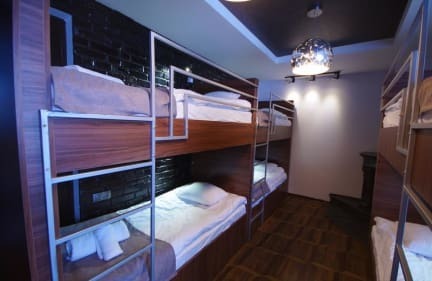 Boutique Hotel & Hostel Medusa is located in the heart of Old Batumi, the most fashionable area in the city, 100 meters from the sea, 300 meters from bars, clubs, restaurants, famous Batumi Boulevard, 200 meters to Chacha Tower, 350 meters to Alphabet Tower, 350 meters to Batumi Dramatic Theatre, 200 meters from 6 km to Batumi airport, 2 km to Bus station and 3.5 km to railway station. All guests are available to use shared kitchen with all needed facility to cook, including tea & coffee. Also, guest will find library and resting area with board games. Breakfast included for private rooms. Wi-Fi is available in the entire place, our staff will offer a lot of tours in Georgia, concerts and a lot of attractions nearby. We offer: one apartment style room with 2 balconies on sea and old town view and kitchen, one standard room with sea view, one superior room with sea view, one triple room with Balcony on old town view, one hostel 6-bed mixed dormitory room and one female 6-bed dorm room both with private bathroom and sea view. All our rooms have private bathroom, Lcd TV, air conditioning, fridge, towels, linens and all needed for your comfort. All our rooms are fresh with modern design and especially selected colors for maximum comfort. All Guests Are Welcome!